Are Maine Democrats About To Rig Election And “Bern” Their Own U.S. Senate candidate? A recent article in the Lewiston Sun Journal suggests Maine Democrats may be planning to rig an election against a candidate of their own party. Senator Angus King is pictured with Senator Tim Kaine, who was Hillary Clinton’s Vice Presidential running mate. Photo credits in picture. AUGUSTA – In politics, some say past is prologue. 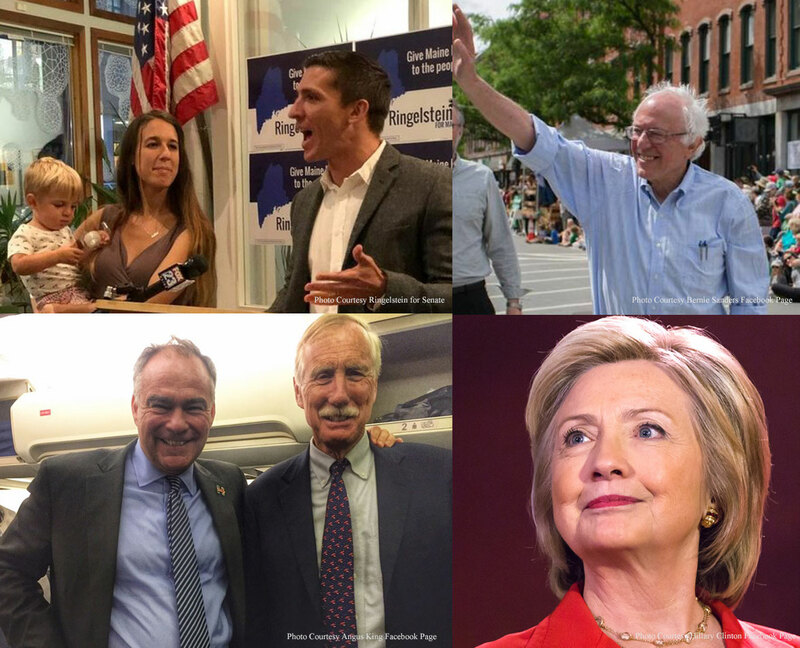 In 2016, a Maine Center For Public Interest Reporting showed how the Maine Democratic Party was funneling money from wealthy donors to Hillary Clinton’s campaign before Democratic voters had cast their ballots in the Maine Democratic Party Presidential Caucuses. Not long after the caucuses, which Bernie Sanders won by a wide margin amid massive turnout, Maine Democratic Party Executive Director Jeremy Kennedy left his post to work for the Clinton campaign. Despite the fact that Bernie Sanders, a Senator from Vermont, won the Maine caucuses by such a wide margin, four of Maine’s five Democratic super delegates, including current state party Chairman Phil Bartlett, cast their powerful superdelegate votes and the DNC Convention for Hillary Clinton. Subsequent email leaks suggested that Maine Democrats had actively worked to block changes to superdelegate rules to protect Clinton’s victory, changes which were led by Diane Russell, a well-known Maine Democrat who had supported Sanders’ candidacy. Some in Maine’s progressive political community said that the fix was in against Sanders, who they saw as the perfect fit to challenge Donald Trump’s populist message. But the damage was done – Clinton was awarded the Democrat nomination and went on to lose the general election, leaving a deeply divided Democrat base in Maine. A new report from the Lewiston Sun Journal reporter Steve Collins suggests Maine Democrats may be about to repeat the actions of 2016 in the upcoming US Senate race, which will likely pit U.S. Senator Angus King against progressive Democrat Zak Ringelstein and State Senator Eric Brakey, a Republican. The article, which prominently features Ringelstein, quotes Mike Saxl, a former Democrat House Speaker, as wanting Democrats to “stick with” Angus King, suggesting he even plans to write King’s name in on the Democrat primary ballot and will urge everyone he knows to do the same. Collins quotes other unnamed Democrat insiders reinforcing Saxl’s concern that voters will actually vote for the candidate from their own party and potentially split the vote away from King, who is not a Democrat and recently rebuffed the party. Surprisingly, Maine Democrat Chairman Phil Bartlett, who oversaw the Maine Democrat funneling of cash to the Clinton campaign before the Maine Democrat caucus, also weighed in, quoted by Collins in the Sun Journal reinforcing the importance of not allowing a Republican to be elected, without voicing support of his own party’s candidate in the general election. Bartlett angered some Maine Democrats in 2016 by casting his superdelegate vote as Maine Democratic Party Chairman for Clinton, even though Bernie Sanders won the Maine caucuses. The only Maine Democratic Party superdelegate to the party’s national convention to cast a ballot for Sanders, who won Maine’s caucuses with 63 percent of the vote, was State Senator Troy Jackson. Rep. Chellie Pingree and the other two of Maine’s superdelegates bucked Maine Democratic Party caucus voters to cast their votes for Clinton, despite Sanders’ overwhelming victory. The superdelegate fight triggered revolts at the 2016 Maine Democratic Party convention and the national convention in Philadelphia. The 2018 U.S. Senate Democratic Primary will see Ringelstein, who was featured in the Lewiston Sun Journal article, challenged by Ben Pollard, who runs a construction company in southern Maine. It is unclear if Maine Democratic Party elites see Pollard as a more acceptable candidate than Ringelstein, or if either of them would benefit from the support of the Maine Democratic Party once they secure the primary nomination. Ringelstein has made a central focus of his campaign a refusal to accept corporate or PAC donations, while Federal Election Commission reports show King has accepted dozens of corporate and PAC contributions from defense contractors, banks, multi-national corporations and more.